Paris – Lectra launches its ‘Fashion On Demand’ offer, empowering industry players to uncover new business opportunities brought about by the strong demand for personalization in the fashion industry. Lectra is enabling its customers to produce on demand for the first time ever with an end-to-end offer that automates the entire personalization process from product development to final cutting stages. ‘Fashion On Demand by Lectra’, based on Industry 4.0 principles, is a fruition of four years of R&D with a hundred-strong team of experts, as part of Lectra’s strategic roadmap announced in 2017. There will be a progressive global rollout starting from January 2019. ‘Fashion On Demand by Lectra’, is a game changer for the industry. Drawing from 45 years’ experience of working with international retailers, manufacturers and brands, Lectra developed this offer to break down these barriers and empower fashion companies to meet the specific needs of their digitally savvy clientele with best-in-class solutions. 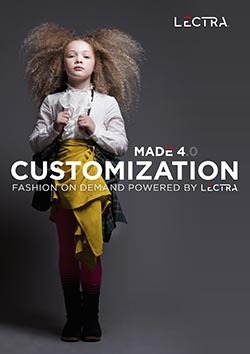 ‘Fashion On Demand by Lectra’, available in the form of two packages, one dedicated to made to measure, and the other to customization, is a turnkey solution that automates on-demand production right from order reception to production development stages and the cutting room. Companies can define the product customization criteria and range for each item depending on the package (such as altering product characteristics for customization and pattern adjustments for made to measure) and launch production processes right from the get-go, without interfering with their standard workflows. “Personalization, or rather, on-demand production, is going to be an industry-wide phenomenon. It is hence Lectra’s duty, as an Industry 4.0 pioneer, to think ahead of time, and spearhead this movement. Keeping our customers’ best interests in mind, we’ve worked with renowned personalization specialists from different countries to develop this solution. With ‘Fashion On Demand by Lectra’ we’re doing the unthinkable. For the first time in the fashion industry, there will be a comprehensive personalization solution that will be able to perform under the same market conditions as the ready-to-wear segment and produce the same, if not better, results,” says Daniel Harari, Chairman and Chief Executive Officer, Lectra.